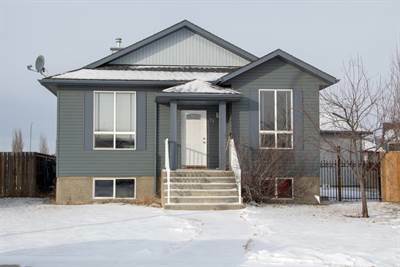 Great starter or investment home, with a big yard, triple heated garage in Sunrise area. 4 level split home, slate tile meets you at the front door. Open concept living area with hardwood running thru out. Kitchen has an island with raised breakfast bar and sink, loads of cupboard space, stainless appliances, and a bump out dining area. The upper floor has 2 bedrooms with a 4 piece bath. Master has his & her closets and sliders out to a west facing deck. 3rd & 4th levels are not finished but has room for 2 more bedrooms or a big master and put the kids upstairs. West facing backyard, with a heated 30×23 garage, single tall door and regular double door large enough for all your toys.